Our family received the 16 pc set. The directions come with projects for the both 16 and 32 pieces so if you would like to go right into building 32 piece designs make sure you pick up the bigger kit. You can purchase the Wedgnetix here, at Target, and Amazon. What WEDGiTS has to say about their product. ImagAbility, makers of the original international building block brand, WEDGiTS™, today announced that its newest attraction, WEDGNETiX™, magnetic WEDGiTS, are now available. Perfect for Back to School learning as well as early holiday shopping season. The amazing new WEDGNETiX (MSRP $39.99 and $69.99 for 16-piece and 32-piece sets) unlocks a new construction potential of WEDGiTS building block toys. WEDGNETiX were created to add even more open ended play patterns for children. With WEDGNETiX, a child, or adult, can explore complex geometry and greater visual appreciation for 2D to 3D relationships. It sounds technical, but it is really just fun and kids don’t realize how educational it is. The unique part about WEDGNETiX is the amazing building process it provides. With WEDGNETiX, you can create original 2D designs that include a square, a rectangle and a hexagon. This is accomplished through the WEDGNETiX design that has a magnet within each component. Specifically, each WEDGNETiX bar has an embedded magnet on one end and a metal cap on the opposite end. This allows two WEDGNETiX bars to fully rotate around each other for a 360-degree rotation. With WEDGNETiX, you can rotate one half of a hexagon upward to reveal a 3D representation of a hexagon. WEDGNETiX do not require instructions like other popular building block products. WEDGNETiX follow the WEDGiTS toy line in that it’s open-ended design allows kids to create freely. ImagAbility does provide design ideas for kids to progress from 2D into 3D constructions, however, there isn’t any “only one way to do things” step-by-step instruction. A key criterion in the engineering design of the WEDGNETiX bar relieves any consumer safety concern. Each bar is a two-sided construction that has a male and a female component. When the two parts mate together they literally sandwich the cylindrical magnet between the parts. The plastic parts, made of an extremely strong ABS plastic, are pulled together, which basically melds the plastic into a single component. In addition, ImagAbility clearly identifies caution on the front of each package, that WEDGNETiX contains magnets. The product is tested and in compliance to the USA’s CPSIA and international ASTM FM963 certification. 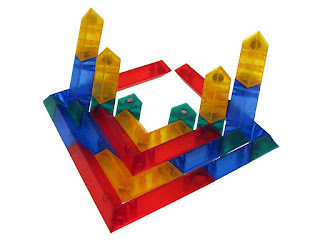 The basic set of WEDGiTS building block toys resemble square donuts and diamonds with angled edges. 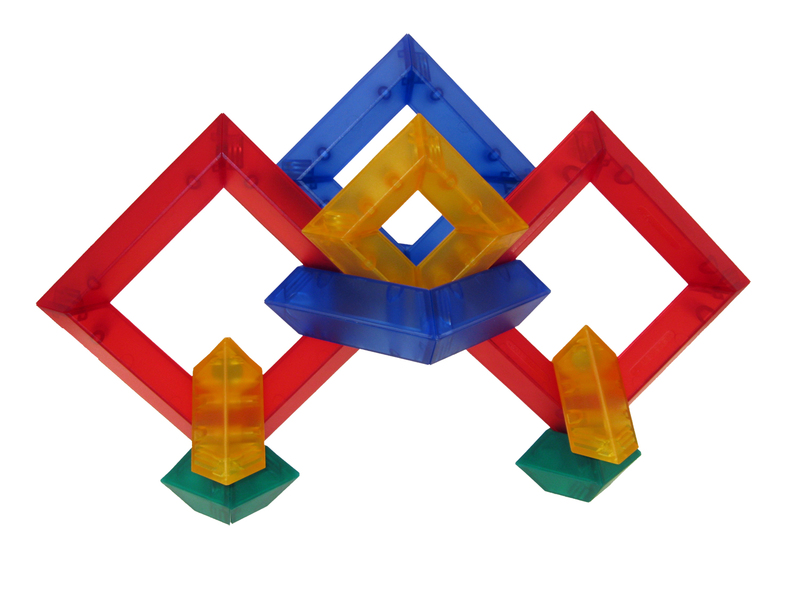 The five, primary pieces of the WEDGiTS toy are graduated in size, so, the blocks actually nest together and stack into the shape of a pyramid. Mathematicians refer to these block shapes as rhombus and octahedrons. Each block is a different primary color, so, you can imagine a rainbow effect of color in each design a child builds. The design of each block naturally aligns in both vertical and horizontal patterns for an open-ended manipulative. In addition to WEDGNETiX and various traditional WEDGiTS sets, other products in the WEDGiTS line include, WEDGiTS on Wheels (WOW) and Mini WEDGiTS™, as well as WEDGiTS school activity packs, building table platforms and other accessories. The award-winning WEDGiTS line has earned ImagAbility honors in Parenting Magazine, Toy Insider, and Learning Magazine, as well as awards and honors from the Oppenheim Toy Portfolio, National Parenting Publications of America, Mom’s Choice, National Parenting Center, Parents Choice, Dr. Toy, and Able Play’s Special Needs Approval. Disclosure: MarksvilleandMe received one or more of the products mentioned above as part of a promotion with Tomoson and WEDGiTS. Regardless, MarksvilleandMe only recommends products or services we use personally and believe will be good for our readers. Some of the links in the article may be “affiliate links.” This means if you click on the link and purchase the item, I will receive compensation. If you would like MarksvilleandMe to review a product or service please contact us at marksvilleandme@gmail.com.